Preserve the ’Burg offers various walking and bicycling tours throughout the area, from October through May. 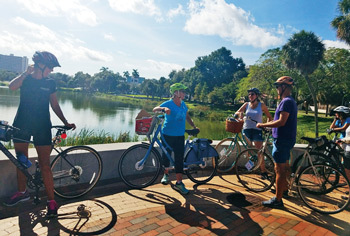 The tour I signed up for was titled, Bicycles, Neighborhoods & Buildings – Keeping St. Pete Special Bicycle Tour. It was a two-hour event and was already full within a few weeks of its promotion. It’s definitely a popular tour. On Thanksgiving weekend, at 10am, I hopped on my bike and rode downtown to meet up with the other tour participants at the Independent Bar on Central Avenue. When I arrived, I met the tour guide, Emily Elwyn, president of Preserve the ’Burg’s board of directors. Emily is an historic preservationist and architectural historian. She has a bachelor’s degree in history and a master’s in heritage preservation. She’s also studied in the Architecture program at Georgia Tech and with the Florida Studies program at the University of South Florida. Emily lives in an old home in the Historic Old Northeast and is an unabashed lover of all things Florida. She’s been leading historic, cultural, and architectural torus since she relocated to St. Petersburg in 2006. Before we started, I introduced myself to some of the tour participants, one of whom was Jim Shirk from Tampa. I had met him before on a couple of fun Florida Bike Tour Urban Restaurant Tours in Tampa, so I wasn’t surprised to see him. 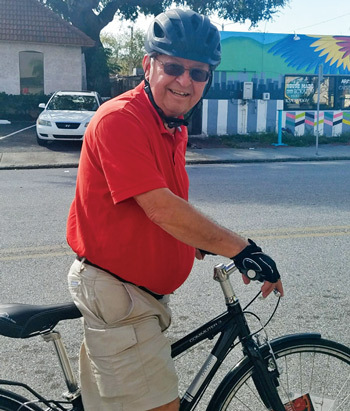 He gets around since he is with the Hillsborough County Bicycle/Pedestrian Advisory Committee and participates at many area cycling events. He told me that these types of historic bike tours started in Tampa. I didn’t have much time to talk to the other riders since we were there to ride not to gab, but I did meet a group of riders who used to be neighbors in St. Pete. 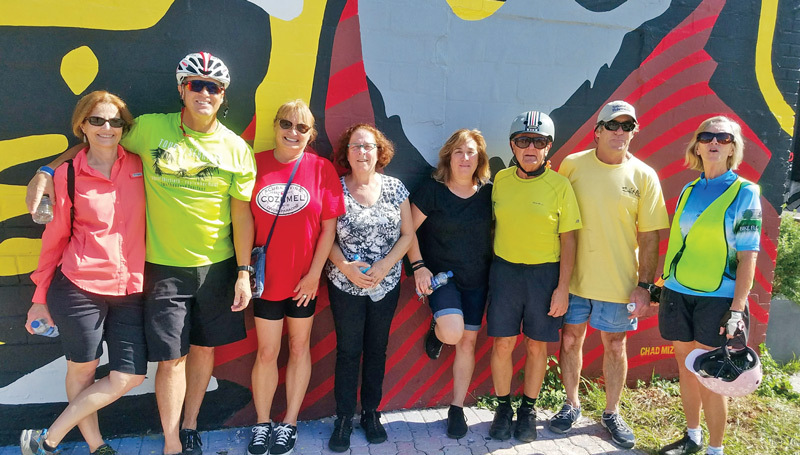 Some have moved to other parts of the country, but they have an annual reunion here and a few of them decided to do the bicycle tour together. I got a few pictures of this fun crew before the ride began. Our tour wound around several neighborhoods and buildings, some known to me, but others were a complete surprise. Our wonderful tour guide, Emily, led us through the city, stopping to show us what makes St. Pete so special, and sharing her knowledge of the history and architecture of these interesting neighborhoods. Here are some highlights from the tour. During the segregation era in St. Pete – which lasted from about the turn of the century until the 1960s – most African Americans lived in just a few specific neighborhoods, one of which was Methodist Town. Development of Methodist Town began during the 1890s and was centered around Bethel African Methodist Episcopal Church (Bethel AME). The neighborhood (bordered by 9th Street and 14th Street North, Burlington Avenue North and Fifth Avenue North) got its name from the church. In 1922, the current AME Church was built on the footprint of the 1894 church. At one time, the neighborhood had its own small business district and a popular hotel called the Robert James – developed by Robert James – which accommodated black entertainers and athletes. Lang’s Bungalow Court Historic District (just off 4th Avenue North, south of Interstate 375) is a tiny historic gem. The neighborhood encompasses ten historic bungalows built between 1912 and 1925, with one more built in the 1950s. All of the homes face a central pedestrian path, with alley access to the rear of the homes. The district was platted by former St. Pete Mayor Al Lang after he visited similar communities in California. In 2015, Lang’s Bungalow Court became a locally designated landmark after two homes were nearly demolished to make way for surface parking. Rumor has it that looking across Mirror Lake provides one of the best views of downtown St. Pete, and as I stopped to look across the lake, I must say, I agree. Mirror Lake (located close to St. Pete City Hall) was originally known as Reservoir Lake. In the early 1900s, it was once the source for the city’s drinking water. There are many historic buildings around the lake, including the historic Mirror Lake Library built in 1915. It is one of the earliest beaux-arts-style buildings in the area and was built with the help of a $17,500 Carnegie grant to the city. The building was locally landmarked in 1990. Another very popular building on Mirror Lake is the St. Petersburg Shuffleboard Club. The first courts were constructed in 1923. Architect Harry Cunningham designed the clubhouse which opened to members in 1927. A second building was added in 1929, and as the club’s popularity continued to grow, a bridge-club/dance-hall was added in 1937. Two years later, grandstands for the courts were built. The St. Petersburg Shuffleboard Club is the oldest and largest shuffleboard club in the world. The site was locally landmarked in 1994. Crislip Arcade (at 645 Central Avenue) was built in 1926 and is an open-air covered hallway with an impressive decorative wrought-iron-gate entryway. Inside, distinctive vintage brown-and-yellow tiles cover the floor, and a string of small retail shops are on either side. At one time there were 10 similar shopping arcades in St. Pete, but unfortunately only three remain. With the advent of malls and air-conditioned stores, shoppers left downtown and Crislip Arcade languished. After years of disrepair, Leslie Curran and St. Pete Preservation (now Preserve the ’Burg) persuaded the developer to create an artist colony, with reduced rents to the businesses. Now, the arcade and the adjacent 600 block of Central Avenue is thriving with locally owned shops. We stopped at The Hyppo Gourmet Ice Pops for a refreshment break where I tried the delicious Peachy Peach flavor. One of the first houses in St. Pete – the Rawls House built in 1898 – is located at 734 Grove Street in the Round Lake neighborhood, on the edge of downtown near 6th Street and 6th Avenue North. The Rawls House is an example of an ‘I-House,’ so named because of the style’s common occurrence in the rural farm areas of Indiana, Illinois, and Iowa. I-Houses were designed to be simple and functional. This is the only known example in St. Pete. Before there were brick streets, the streets were made of crushed shells. In 1941, there were 339 miles of brick streets; in 1989, there were less than 100 miles; and in 2015 there were just 81 miles. But the remainder are protected. If you remove them to make repairs, you must replace them. Although most of the bricks are Augusta bricks, there are many other makers of the bricks making up the streets of St. Pete. In some of the bricks, you can see fingerprints! The newest local historic designated landmark (2018) is Huggins-Stengel Field beside Crescent Lake. The field was created in 1925 as the practice field for the Yankees. It has not changed or been leveled since it was first built. The Australian Pines were planted at the request of Babe Ruth because he said the lake caused a reflection. One of the bike-tour participants added that it is said Babe Ruth would not play the outfield because of the alligators in Crescent Lake. After the Yankees left, next came the Mets, then the Orioles. The Crescent Lake water tower was built in 1923, is 175 feet high, and holds 500,000 gallons of water. It is designated a local landmark and is still in use. It is the only remaining historic water tower in the City of St. Petersburg. In 1994, artist Tom Stovall painted a mural on the tower of fish living in Florida’s underwater coral reefs. Tom restored the mural in 2016. We completed our tour by riding back to where we started via the new bike lanes on 9th Street North. I highly recommend the bike tour. If you don’t own a bike, you can rent one from Coast Bike Share. For tour info, visit www.preservetheburg.org/walkingtours. Enjoy!